Beginning in 1969, astronomers discovered that three of the giant planets, Jupiter, Saturn, and Neptune, each radiate about twice as much energy as they receive from the Sun. Those planets each contain a powerful energy source which was inexplicable until J. Marvin Herndon, pictured at left, demonstrated in 1992 the feasibility of natural, nuclear fission reactors as the energy source for those planets . 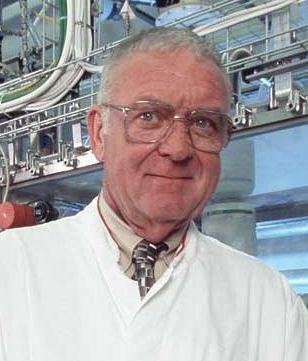 Herndon initially considered thermal neutron reactors moderated by hydrogen, but soon realized that without hydrogen, the reactors would function quite well as fast neutron breeder reactors. Aware that the uranium resides almost exclusively in the alloy portion of the Abee enstatite chondrite, the part corresponding to the Earth's core, in 1993 Herndon published a scientific article, entitled "Feasibility of a nuclear fission reactor at the center of the Earth as the energy source for the geomagnetic field" in the Japanese Journal of Geomagnetism and Geoelectricity . He followed that a year later with an article in the Proceedings of the Royal Society of London . Both articles, like his 1996 article in the Proceedings of the National Academy of Sciences USA  were based upon calculations Herndon made using Fermi's nuclear reactor theory. These began a series of step-by-step developments which have carried forward to the present [5-11] and have resulted in a fundamentally new understanding of georeactor structure, georeactor dynamics and georeactor generation of Earth's magnetic field. For more than thirty years, scientists and engineers at Oak Ridge National Laboratory have worked to develop, improve, and validate software for numerically simulating the operation of different types of nuclear reactors. Minor modifications were made to the software allowing numerical simulation of Earth's georeactor, which J. M. Herndon published with D. F. Hollenbach in 2001 in the Proceedings of the National Academy of Sciences USA . The numerical simulation calculations, published in 2001, demonstrated that that Earth's georeactor is capable of functioning over the entire period which the Earth has existed, 4.5 billion years, and is capable of producing power at the same levels estimated to be necessary for powering the geomagnetic field. The calculations also showed that the georeactor would operate as a fast neutron breeder reactor and that it must have some inherent mechanism for regulating operating power and for removing fission products. Moreover, the helium fission products from the georeactor turned out to occur in the same range of compositions as the deep-Earth helium found in oceanic basalt . Since the late 1960s, scientists throughout the world have found traces of helium in volcanic basalt that comes from within the Earth. Two isotopes of helium are observed, helium of mass 3 and helium of mass 4. Helium-4 was not a surprise because helium-4 is a product of the natural radioactive decay of uranium and thorium. Helium-3, however, was a great mystery as scientists were unaware of any deep-Earth natural mechanism for major production of helium-3. Lacking knowledge of an adequate deep-Earth production mechanism, scientists, for more than thirty years, have assumed that the observed helium-3 is a relic left over from planetary formation 4.5 billion years ago. To explain the helium found in volcanic basalt, scientists have also had to assume that about 9 times as much helium-4 from radioactive decay had to have been mixed with the assumed primordial helium-3 in such a way as to give a rather narrow range of compositions, shown statistically for 95% confidence in table at right. But then along came the georeactor numerical simulations. The figure at left shows more precise helium fission product data for two numerical simulations, published in 2003 by J. Marvin Herndon in the Proceedings of the National Academy of Sciences USA . 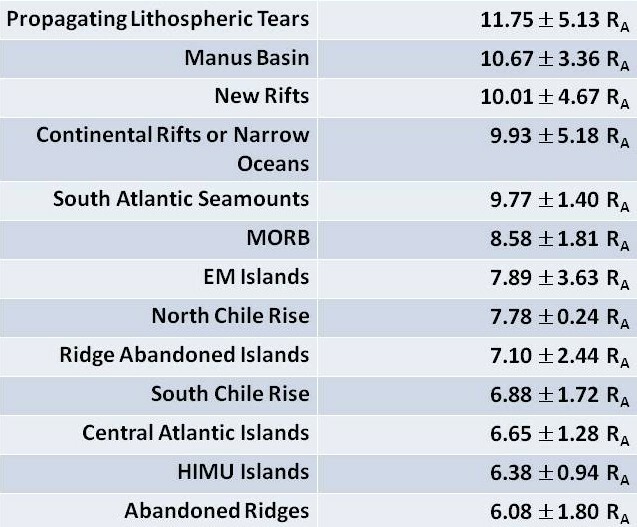 for comparison, two bands are shown representing the ranges of helium ratios for mid-oceanic ridges and abandoned oceanic ridges. The arrow shown points to the present age of the Earth. TW stands for million-megawatts, the unit of georeactor power. 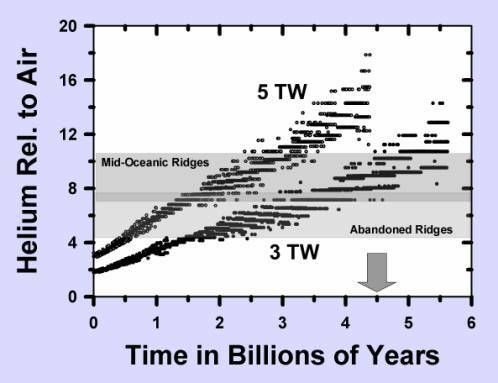 Note the upward trend in the helium isotope ratios with the passage of time. The increase in the He-3/He-4 ratio is a consequence of the decrease in helium-4 from radioactive decay as the uranium fuel is consumed by nuclear fission. High He-3/He-4 ratios, some as high as 37 relative to air, are observed in Hawaiian and Icelandic basalts. These high ratios are an indication that the end of the georeactor's life is approaching, which means as well the end of the geomagnetic field, but the time frame is unknown . The helium coming out of the Earth is strong evidence for the georeactor's existence. See reference  to download an excellent description of the helium problem solved. Ultimately, other evidence for georeactor existence may arise, such as seismic evidence and antineutrino evidence. At present, resolution of earthquake waves is not sufficient to reveal the georeactor. Detecting antineutrinos from georeactor fission products holds potential, but technological advances are necessary. Antineutrino measurements to date have not refuted the existence of the georeactor , but set an upper limit of 3TW (terawatts) on its energy production. That 3TW does not include the contribution the from radioactive decay energy of the georeactor's associated uranium (and possibly thorium). For more than a century, since Fredrick Gauss, scientists have known that the seat of the geomagnetic field lies at or near the center of the Earth. Because of energy-draining interactions with the solar wind and with the matter of Earth, scientists also know that there is an energy source, residing at or near the center of earth, continuously supplying energy to sustain the magnetic field; otherwise the field would soon collapse. In 1939 Walter Elsasser proposed that the Earth's magnetic field is produced by a convection-driven dynamo mechanism in Earth's fluid core. Elsasser envisioned convection motions in the fluid core being twisted by planetary rotation into a dynamo, essentially a magnetic amplifier. In 1993, when J. Marvin Herndon demonstrated the feasibility of a nuclear fission reactor at Earth's center, he envisioned the georeactor as being the dynamo's energy source. Beginning in 2007, J. Marvin Herndon began to discovered reasons why convection is physically impossible in the Earth's fluid core, and proposed instead that the Earth's magnetic field is generated, not in the fluid core, but in the georeactor fission-product sub-shell [8-12], illustrated at left. There are two reasons why convection is physically impossible in the Earth's fluid core. but not in the georeactor sub-shell. First, for long-term stable convection, the top of the fluid has to be cooler than the bottom. Thus, heat brought to the top must be efficiently removed. The Earth's core is covered with a thick, thermally-insulating blanket, the silicate mantle, which prevents efficient heat loss [8, 9]. Second, convection is physically impossible in the Earth's fluid core [11, 12]. J. Marvin Herndon discovered that, because of compression by the weight of the earth above, the matter at the base of the fluid core is too dense to float to the top as a result of thermal expansion. Convection under those circumstances is physically impossible. Herndon also discovered that the Rayleigh Number, often used to justify convection, is inappropriate for the core, as the Rayleigh Number was derived for an incompressible fluid, a fluid of constant density, of which the core is not. The base of the core is about 23% denser than the top. 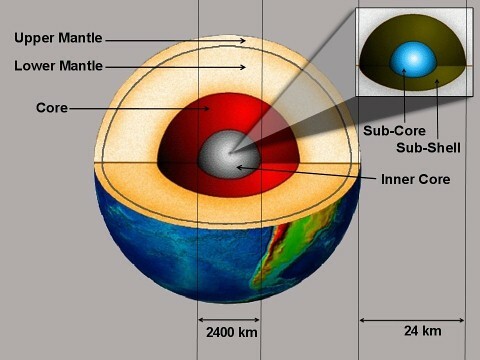 The impediments to convection in the Earth's fluid core, as noted by Herndon [11, 12], do not exist within the georeactor sub-shell. It is expected that convective motions within the electrically conducting fluid (or slurry) sub-shell will interact with the Coriolis forces produced by planetary rotation and act like a dynamo, a magnetic amplifier, as illustrated at right. 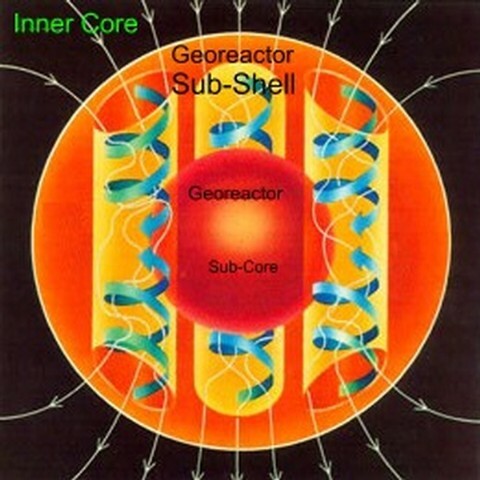 And, unlike in Earth’s fluid core, the georeactor sub-shell contains large amounts of neutron-rich radioactive fission-produced elements which beta decay yielding electrons for generating magnetic seed-fields for amplification. The georeactor unit thus acts as both the energy source and the operant fluid for generating the Earth’s magnetic field by dynamo action. Even though variations in nuclear fuel occur over time, Herndon's georeactor uniquely is expected to be self-regulating through establishing a balance between heat-production and actinide settling-out . In the micro-gravity environment at the center of Earth, georeactor heat production that is too energetic would be expected to cause actinide sub-core disassembly, mixing actinide elements with neutron-absorbers of the sub-shell, quenching the nuclear fission chain reaction. But as the denser actinide elements begin to settle-out of the mix, the chain reaction would re-start, ultimately establishing a balance, an equilibrium between heat-production and actinide settling-out, a self-regulating mechanism. The Earth's magnetic field has been decreasing in intensity over the past hundred years. 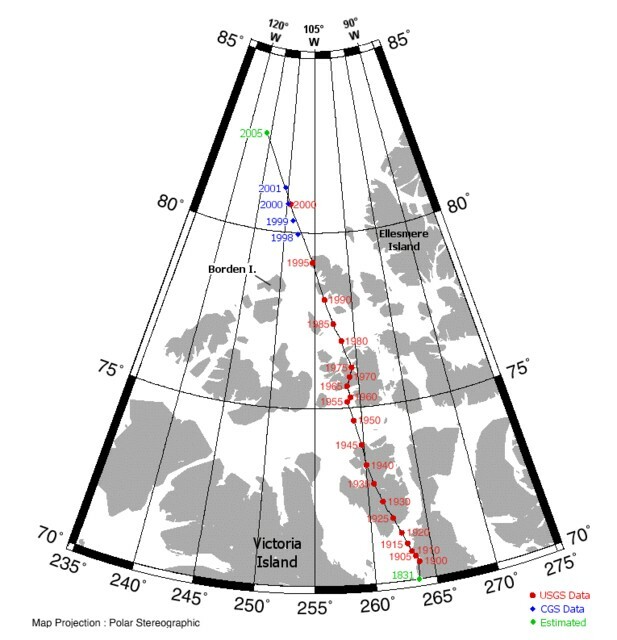 Moreover, as shown in the figure at left, the North Magnetic Pole has recently moved at a rapid rate toward Siberia. These observations are taken by some as a possible indication of a forth-coming magnetic reversal, potentially the first in some 700,000 thousand years. External influences, Herndon suggests, intermittently disrupt the stability of georeactor geomagnetic field generation and possibly lead to a magnetic reversal. For example, electrical currents induced by superintense solar outbursts would cause heating in the georeactor sub-shell, possibly disrupting convection. Severe Earth trauma might also disrupt disrupt convection in the georeactor's sub-shell. Because the georeactor mass is about one ten-millionth that of the fluid core, such changes might occur quickly. Currently active internally generated magnetic fields have been detected in six planets (Mercury, Earth, Jupiter, Saturn, Uranus, and Neptune) and in one satellite (Jupiter’s moon Ganymede). Magnetized surface areas of Mars and the Moon indicate the former existence of internally generated magnetic fields in those bodies. J. Marvin Herndon has presented evidence attesting to the commonality of matter in the Solar System, which is like that of the deep-interior of Earth, and has made the suggestion [9, 10] that planetary magnetic fields generally arise from the same georeactor-type mechanism which Herndon [8, 9] has suggested powers and generates the Earth’s magnetic field. YouTube Video: Origin of Earth's Magnetic Field (click here) This video is best "watched in high quality" as it contains an experimental demonstration of why long-term convection, and hence dynamo-action, in the fluid core is impossible. After publication of Herndon's scientific articles on Earth's nuclear georeactor [1-9], several "copy-cat" georeactors were published. Copy-cat georeactors, purportedly operating at places within the deep-interior of Earth other than at its center, are all absent of a mechanism for preventing the inevitable meltdown to the center of Earth and are absent a mechanism for self-regulation as disclosed by Herndon for the georeactor . Herndon, J. M., Nuclear fission reactors as energy sources for the giant outer planets. Naturwissenschaften, 1992, 79, 7-14. 9. Herndon, J. M., Maverick's Earth and Universe. 2008, Vancouver: Trafford Publishing. ISBN 978-1-4251-4132-5. 12. Herndon, J. M., Origin of the Geomagnetic Field: Consequence of Earth's Early Formation as a Jupiter-Like Gas Giant: Thinker Media, Inc., 2012, ISBN: 978-1-938240-91-1. 13. Gando, A., et al., Partial radiogenic heat model for Earth revealed by geoneutrino measurements. Nature Geoscience, 2011, 4, 647-651. 15. Mjelde, R. and Faleide, J. I., Variation of Icelandic and Hawaiian magmatism: evidence for co-pulsation of mantle plumes? Mar. Geophys. Res., 2009, 30, 61–72. 16. Mjelde, R., Wessel, P. and Müller, D., Global pulsations of intraplate magmatism through the Cenozoic. Lithosphere, 2010, 2(5), 361–376.